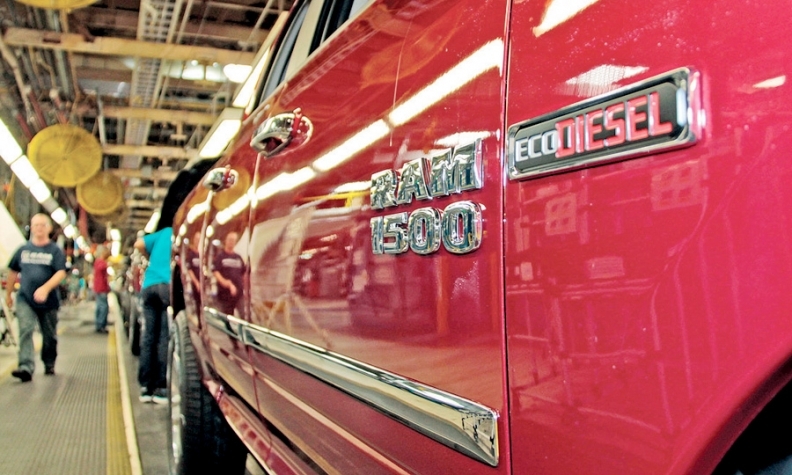 A Ram 1500 EcoDiesel comes off the line at Chrysler Group's Warren, Mich., plant. DETROIT -- Chrysler said last week that it plans to produce more light-duty, diesel-powered Ram pickups to meet strong demand. The company said the optional diesel engine will account for 20 percent of the Ram 1500 pickup's annual production, an estimated 70,000 vehicles, up from 10 percent today. The Automotive News Data Center estimates that Chrysler's Warren, Mich., plant will assemble about 335,000 Ram 1500s this year. The company also builds a small number of light-duty Ram pickups in Saltillo, Mexico. The company said the increase in the EcoDiesel mix will be completed by the end of November at the Michigan and Mexico plants. In addition, Chrysler said two weeks ago that it was increasing Ram output at the Warren factory by about 28,500 units a year by revamping hundreds of workstations and reducing waste on the production line. The Ram EcoDiesel, which carries the industry's highest EPA highway rating for pickups at 28 mpg, has become one of Chrysler's fastest-selling vehicles since its launch in February. Overall, U.S. sales of the Ram pickup including 2500 and 3500 models have climbed 22 percent to 319,868 this year through September. Chrysler said last week that nearly 60 percent of Ram 1500 EcoDiesel deliveries have been conquest sales from rival truck brands -- a notable achievement given the segment's high customer-loyalty rates. The 3.0-liter EcoDiesel V-6 engine is built in Cento, Italy, by Fiat subsidiary VM Motori S.p.A. Chrysler spokesman Nick Cappa said Ram worked with VM Motori to obtain more diesel engines specifically for the Ram 1500 and that Jeep Grand Cherokee diesel production would be unaffected. Ram has owned the truck fuel economy crown in both gasoline and diesel pickups this year. But among gasoline-powered pickups, a special, low-volume SFE, or Super Fuel Economy, version of Ford's aluminum-bodied 2015 F-150 coming in December will likely knock the 3.6-liter gasoline-powered Ram 1500 from the top spot. The Ram 1500 V-6 HFE, or High Fuel Economy, carries an EPA rating of 25 mpg on the highway, while the 2014 F-150 has a top highway rating of 23 mpg. Ford said last week that the 2015 F-150 will deliver between 5 and 20 percent better fuel economy, placing the most fuel efficient F-150 at 27 or 28 mpg highway. Pricing on the Ram EcoDiesel Crew Cab, a popular model, starts at $37,915, including shipping.